What are the Colors of a Diamond? Diamond Color refers to the degree to which diamonds are colorless. Diamonds with very little color are the most highly valued and are priced accordingly. A little color can diminish a diamond’s brilliance. Like a prism, diamonds divide light into a spectrum of colors and reflect this light as colorful flashes called fire. Just as when looking through colored glass, color in diamonds will act as a filter, and will diminish the spectrum of color emitted. The less color in a diamond, the more colorful the fire, and the better the color grade. Diamonds graded better than J are colorless or near-colorless. Diamond color is typically undetectable to the unaided eye. D – Absolutely colorless. The highest color grade for diamonds, which is extremely rare. E – Colorless. Only minute traces of color can be detected by an expert gemologist. Diamonds graded E are rare. F – Colorless. Slight color detected by an expert gemologist, but still considered a “colorless” grade. These are high-quality diamonds. G-H – Near-colorless. Color noticeable when compared to diamonds of better grades, but these grades offer excellent value. I-J – Near-colorless. Color slightly detectable. “In diamonds, rarity equals value. With diamonds in the normal range, value is based on the absence of color because colorless diamonds are the rarest. 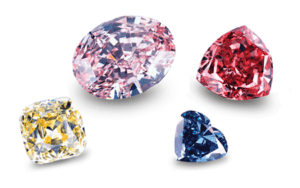 With fancy color diamonds, the ones outside the normal color range – the rarest and most valuable colors are saturated pinks, blues, greens, and even reds. In all cases, even very slight color differences can have a big impact on value. Diamonds with a noticeable hint of any other hue are considerably more rare. Even in light tones and weak saturation, as long as they show color in the face-up position, they qualify as fancy colors. Terminology with natural fancy diamonds ranges from ‘Fancy-Light,’ ‘Fancy,’ ‘Fancy-Intense,’ ‘Fancy-Vivid,’ or ‘Fancy-Deep.’ The more saturated in color, the more valuable. Natural fancy colored diamonds can also be a wise, long-term investment. Olschwanger Designs supplies the highest quality diamonds in Dallas. We will help you pick a stone that meets your needs at a price you can afford. Our diamonds are GIA certified, and the most affordable anywhere. Call us at 972-458-8352 to schedule an appointment to discuss your jewelry needs. Whether in Dallas or somewhere else, we’ll take care of you.